Your Absolutely Essential Everything You Need to Know About Vision Zero Guide! In light of our partnership with Innovate Durham and making the semifinals of the Pittsburgh City of Tomorrow challenge, we’re bringing back our guide to all things Vision Zero in the US. We analyzed each of the 35 cities (so far!) that have committed to eliminating traffic fatalities and serious injuries to see what’s being done - and not done - to get to zero. Check out our handy dandy Cliff-notes version (um, are we dating ourselves?) to see how these cities are stacking up as they valiantly work to make streets safer. As with the City of Durham and the City of Pittsburgh, State of Place can help you get there with data-driven solutions for maximum impact. Schedule a call with us so we can tell you how! For the basics, we categorized each city's Vision Zero strategy on the basis of whether it's a focus city or emerging, it has an action plan, gathers data on crash hotspots, has a complete streets policy (whether or not its integrated into the Vision Zero strategy), and has an urban design focus. Oh, and we did it as an interactive map because cities and we are State of Place, after all! Last night, one of my interns, actually the one who did all of the research for this blog (because you know that's how it goes! ;) told me (after reading a transcript of a chat with me and a prospective customer while he was visiting the State of Place website while watching the World Cup - and while I was partaking in some rum at 230am on a Saturday night) that I was seriously "goals." Let's ignore the potential pun here and note that it's seriously these cities that have like, goals! And it's amazing. You go City of Fremont! Five years to Vision Zero. As far as we're concerned, the sooner the better (plus we know data can help you get there faster, so call us - or chat with me in the middle of the night on our website - apparently I'm pretty funny)! So without further ado, below are 23 of the 35 cities who have set a clear start and end date for perhaps one of the most important races of our time. Bellevue, WA (from their webpage): "Vision Zero instills a more holistic and comprehensive view regarding traffic fatalities and serious injuries: they are not inevitable." Cambridge, MA: “Making Cambridge safe and equitable for everyone who travels here." Durham, NC: "Working together, we can achieve zero fatalities on our roadways because every person in our community matters." Portland, OR: "Portland aims to eliminate traffic deaths and serious injuries by 2025 through equitable and data-driven actions." Santa Barbara, CA: "Vision Zero has transformed how we manage our transportation network." San Diego, CA: "Making our streets and sidewalks safer as we live, work and play." In true SaaS (software as a service) startup style, we broke down all the "goodies" - Vision Zero strategies - to see how each city's "features" stacked up. Clearly, in this case, you may not necessarily be choosing between each of the cities, but we do hope this helps current Vision Zero Cities - and those that aspire to be - quickly understand what other cities are doing and perhaps borrow from the best (and truly take a page out of the startup handbook!). Ok, so maybe it's like totally 2010s but we still love us some word clouds! And we thought this might actually be an effective way to understand what cities were truly prioritizing (consciously or otherwise) when it came to their Vision Zero strategies. We inputted the executive summaries of all 35 Vision Zeros to see what stood out. And indeed, the good ole' word cloud did not disappoint. As we surmised (and continue to lament), the role of design is pretty diminished in this picture - as is data, despite the fact that it's often highlighted by cities as a key tool to fulfill their aims. Additionally, while thankfully "people" is fairly prominent, "public," "pedestrian," "communities," and "users" are all unacceptably miniscule. And words like engage, participation - heck happy - are conspicuosly absent. We thought it was important to clearly lay out the giant undertaking that these courageous cities have taken on. We compiled key stats on the the number of pedestrians (including cyclists) deaths (in 2016), the percentage of collision fatalities that were pedestrians, and the pedestrian fatality rate for 100K population. It was important to include all of these metrics so as to be able to make better comparisons between these cities who vary widely by population and mode share. For example, take the City of Los Angeles, while they had the highest absolute number of pedestrian deaths, the rate of deaths per 100K in population falls in the mid-range for these Vision Zero cities. Additionally, while San Diego and Philadelphia had similar numbers of pedestrian deaths (42 and 43, respectively), Philadelphia's pedestrian mode share of 8.3% is much higher than that of San Diego's at 3.1%, indicating that their streets are more deadly. Note that we were only able to compile this data for 27 of the 35 cities for which data was available and even then, it was incredibly difficult to find this data - and even one city (Orlando) put their data behind a paywall (sorry, we didn't pay on account of it's supposed to be public info!). Anyway, please do dive into the data we did dig up. We are very happy to report that the Vision Zero effort, true to its original ethos, is indeed quite multidisciplinary. Most cities have at least two different departments working on the initiative and many have upwards of 10 or more different departments involved in the effort. Only the City of Durham seems to be going at it alone, with their efforts being led by their DOT. The teamwork that the grand majority of these cities are undertaking is certainly to be lauded, but it's important to be aware of the too many cooks in the kitchen risk. Additionally, cities must work to work together not just in a multidisciplinary way but in a transdisciplinary one in which people get outside of their silos, jargons, and lexicons and truly contribute their varying areas of expertise in a whole is bigger than the sum of its parts kinda way. Cities - we want you! So cities - on this list or wishing to be on it - we'd love to hear directly from you about your strategies, what's working and what's not, what you need help with (data anyone?! ), what you're most excited about, what keeps you up at night - all of it! Get in touch. 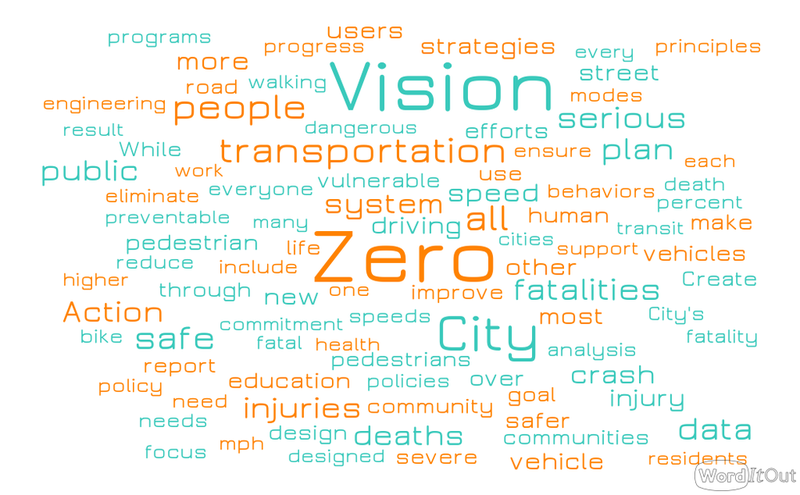 We'd love to feature you in our Vision Zero case studies, interview you for our podcast, and/or actually help you use data - and integrate better urban design - into your strategies (in particular to help you prioritize which changes will actually have the biggest impact)...because it's all about getting to zero, together, as fast as we can. Use data to get to zero, today! Newer PostPlace Your Vote - for Place!